As May opens, late spring wildlife breeding season is in fuzzy, feathery baby-oriented swing. Welcome to Wildlife Wednesday and with a few shots, I’m celebrating mommies, daddies, and babies! Athena and her two, bobble-headed babies. Weeks ago, on a chilly, blustery day, I visited the Lady Bird Johnson Wildflower Center where photos of flowers proved nearly impossible because of the whoosh of winds. 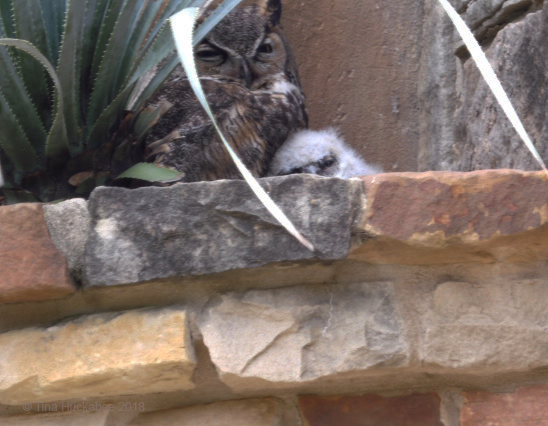 However, the resident Great Horned owl, named Athena and her 2018 offspring, rested quietly in their nesting spot above the entry to the courtyard, providing a good show for admiring wildlife fans. Oh, mommy, you’re so nice and warm! I gaggled and goggled at the beauties, but Athena was unimpressed with me and probably, a bit tired. All the humans were agog at the owls; it’s not often that we are privileged to see such birds up-close. I looked for Athena’s mate, who was probably perched in a nearby tree, but didn’t see him. Those who visit the center near to closing time have witnessed him bringing Athena and the babies a snack. Good daddy! The babies are expected to fledge any day now–if they haven’t already. For the first time in nearly a decade, no Eastern Screech-Owl, Megascops asio, set up a nursery in my garden. I’ve missed hosting an owl family: mommy and daddy working together, raising fluffy chicks to fledge, and then observing the family for another couple of months as the parents feed–and teach hunting skills–to their raptor offspring. I only heard and saw one owl, who trilled sadly for a mate, with no return calls from another. He or she rested for one day in our nest box, but apparently never found his or her true love. Several neighbors in my part of the neighborhood used rat bate during the spring and winter and I suspect that the poisons killed some of our neighborhood adult Screech owls; currently, there isn’t an adult population in our neighborhood. Please don’t use poisons–of any sort. The collateral damage to other creatures exists and has devastating consequences throughout the food-chain. It’s never only the critters targeted who die. Leave unwanted and unwelcome rodents to the raptors and rat snakes–that’s their role in the ecosystem and they fulfill that role admirably–if we let them. Wishing Athena and critters everywhere success and safety in raising their families. Diversity is the key to a healthy environment and we’ll all pay a steep price if that diversity continues to decline. Kudos to mommies and daddies who love and protect their babies! What wildlife happenings did you share in or observe this past month? Please post about your wild happenings and leave a link when you comment here–and happy wildlife gardening! 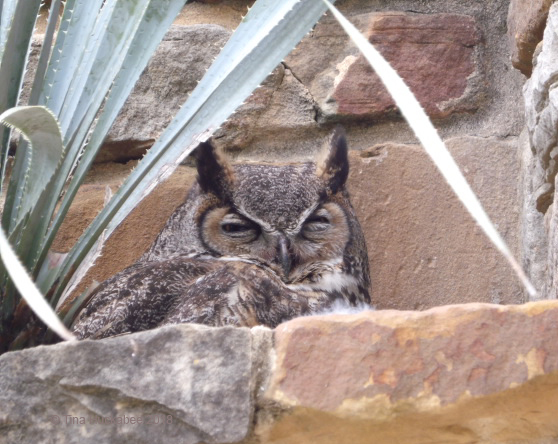 This entry was posted in Backyard Birding, Eastern Screech Owls, Great Horned Owls, Uncategorized and tagged Biodiversity, Widlife gardening, Wildlife Wednesday by Tina. Bookmark the permalink. I can’t believe the owl was in such a public place and allowed you to take such great photos. I’m sorry to hear your owl is not back. I have heard the Barred Owl that hangs out around my house, but I have not seen it. Athena has nested there for 7 or 8 years. I was probably 30 feet away and she’s about 8-10 feet up. I noticed recently that the LBJWC reminded visitors that once the babies fledge, that they might be on the ground and to keep a respectful distance. I hope you get to see your Barred owl–I’ve only seen them in sanctuaries. A few years ago one of the Barred owls would be out in the daytime and I was able to see and identify it. Lately, I have only heard it. Ah, so cute. What a great privilege to see Mama and babies so clearly in such a public place … wildflowers too. Sorry to hear how sparse your screech owls seem to have become. A different story from last year too. How quickly things can change! Good luck persuading people to give up their rat poison. Athena is so amazing, I enjoy looking for her during spring visits. You got a great picture of the baby. Agree, there’s no reason to use rat poison. Of course no one wants rats in their house but there are ways to get rid of them without killing everything around. Visitors to my garden during the last few weeks, mostly small ones. Yup, I don’t want rodents in my house either, but those bait stations are the worse! 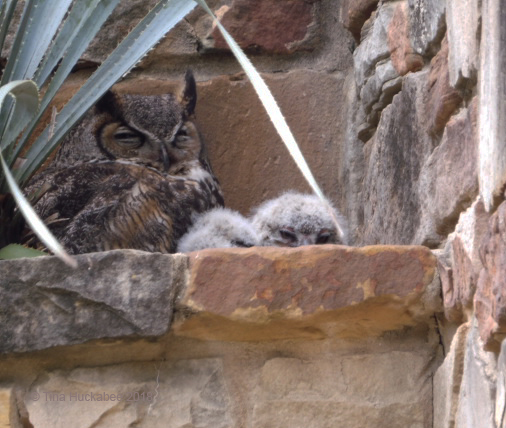 The picture of that sleepy mama owl brings back memories of when our own kids were babies! Yes, I had the same remembrance. I guess tired parents is universal. It really is special to see Athena and her babies each spring. She’s in a safe spot and tolerant of gawking humans. Between the hawks and snakes, we see dead voles occasionally but nothing inside the house! We are hoping our Mississippi kites breed again this year, and we just saw one in a nearby tree! We lost the dead elm they used last year to help their fledglings learn to fly and are in the process of constructing some sort of perch that might substitute. Any suggestions on design? Needs to be about 15 feet tall! You’re so lucky to have had nesting Mississippi kites! I’ve never seen one, except in photo form. Check out Audubon or Cornell lab of ornithology for info on helping the kites, those organizations might be able to answer your questions. What a perfect name for an owl! We have both hoot owls and screech owls here, as well as something in between that makes a weird noise that does not sound like an owl at all. I do not know what species any of them are. The little in between owl sometimes hides out in trees in town. I do not know why. It is quite a surprise to come out of the post office in the evening and see one just a few feet above. They are quite small, about the size of a crow, but stout. However, they have surprisingly BIG bright eyes to stare back with! Owls are so wonderful and observing them is a real treat. I’m sure you could probably find out what kind of owl you’re not sure about by contacting a local birding group. Barred owls are common throughout the US; smaller than Great Horned, larger than Screeches, that might be your mystery bird. I would ask, but they are too intimidating to talk to. I was just talking to my colleague in the Los Angeles area about a HUGE white owl who swoops over from the neighbors tree, towards his driveway, swerving to the next door neighbors back yard. It is not seen very often, and some think it is a myth. I have seen it! Haha. Birders are tricky to deal with, that’s for sure. Still, they do love their subjects and are usually happy to talk all feathered things. Birders? I meant the owls. They have big scary eyes and they always look angry! I happened to see Athena’s photo on another blog, and was astonished at the access people have to her. I’m so glad you got to see her, too, and posted more photos for us. On the other hand, I’m really sorry about your lack of owls. People just don’t think about the unintended consequences of using the stuff. Down here, of course, the problem is the wild hogs. There were plans afoot to use a poison to control them, but that came to a halt after plenty of people objected, saying the threat to other animals and birds was just too great. On the good side of the ledger, I’m sure now that I’m feeding at least two blue jay families, and maybe three. Adults are flying in for their peanuts from at least two directions, which pretty much suggests at least two nests. I learned a trick to help out the cardinals, too. When I put out the peanuts in the shell for the bluejays, I roll them with my foot to crack them a bit. The pigeons still can’t get to them, but the cardinals can get the peanuts out. Today, I saw both male and female cardinal having a snack. I do love them — it’s great to have them around. And I think I hear their babies cheeping now — maybe they’ll bring them up. I followed the controversy about the use of poison bait for the hogs–I’m glad cooler (and better educated) minds prevailed but it’s a constant battle. I hope that we’ll have owls again, but it concerns me greatly that people don’t think through the consequences of their actions. The human condition, I fear. I also have a nesting pair of Blue Jays. They’re toward the back of a Mt. Laurel, so it’s hard for me to watch anything except their comings and goings and their dive-bombing the squirrels. Thanks for the tip about pre-crushing the shells. What a great idea! I’ll try that, though I don’t think I’ve ever even seen the Cardinals show interest in the peanuts, but I’ll give it a whirl. Tina must be wonderful to see Athenea with her two babies that are two treasures so close. The photos are magnificent. I am sorry that this year there has not been any Shrew Owls raised in their nest house; and I feel a lot more that adults are not heard in the vicinity of your house. It is a pity. But that’s life. There are many other dads and mothers with babies taking care of them at the moment, since in their great Sycamore and in hiding places of their garden and near it. Happy Wednesday of Wild Life! Have a great week. Greetings from Margarita. Yes, there are lots of newly born birds and I do hope that we’ll get owls again, maybe next year. You have a wonderful week, too! Oh my gosh they are so adorable and fuzzy!! Ah, you are so lucky. I have owl envy! It was lovely to observe mom and babies! Yes to both. On the upside, we were out for a walk late yesterday evening, visiting with some neighbors down the street from us when we enjoyed the trill of a Screech (just one!) in their, or their neighbor’s live oak tree. Yay! !